The Hongdae region of Seoul always delivers a healthy dose of spectacle to those seeking escapism from the conservative work-focused society in South Korea. Home to one of the top fine art universities in the country, the district has become a haven for indie arts, music, and spontaneous events of creative nature. The streets are alive with a spirit that anything can and will happen. 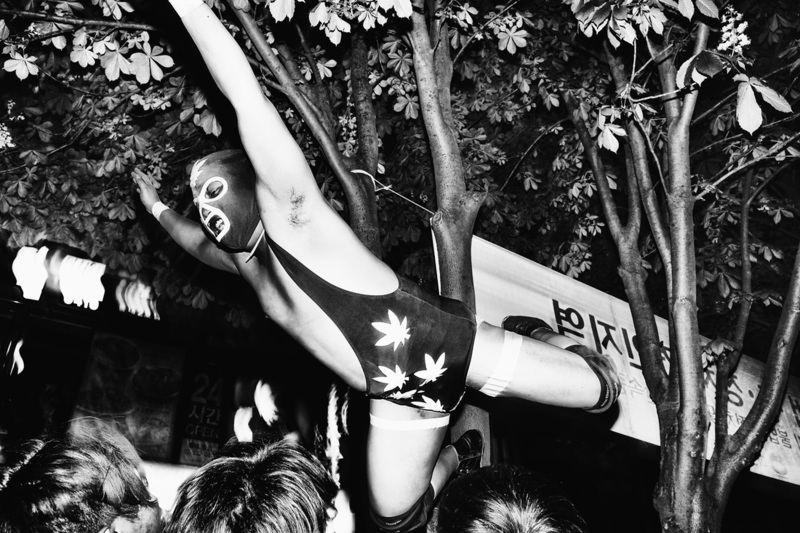 That made Hongdae the perfect setting for an evening of gorilla performances by a largely unknown troupe of wrestlers. 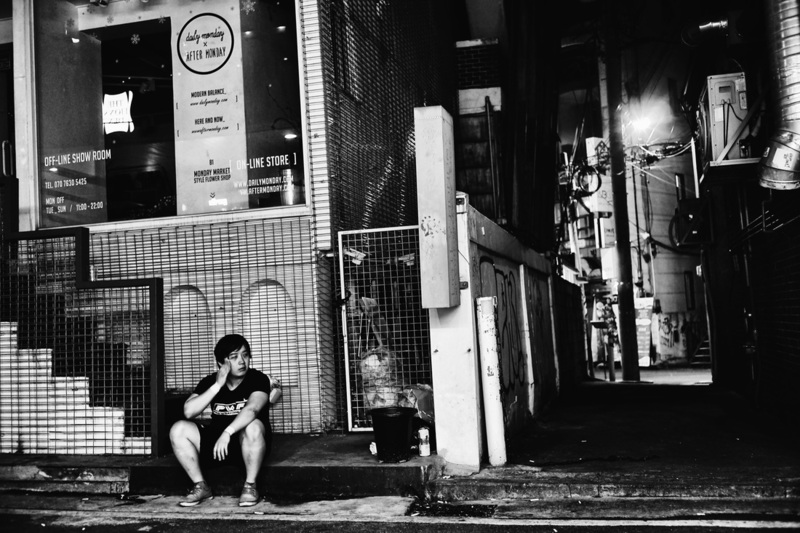 Pro Wrestling Fit is a South Korean wrestling group that fights anywhere, be it in a gym, club, or even a busy city street. 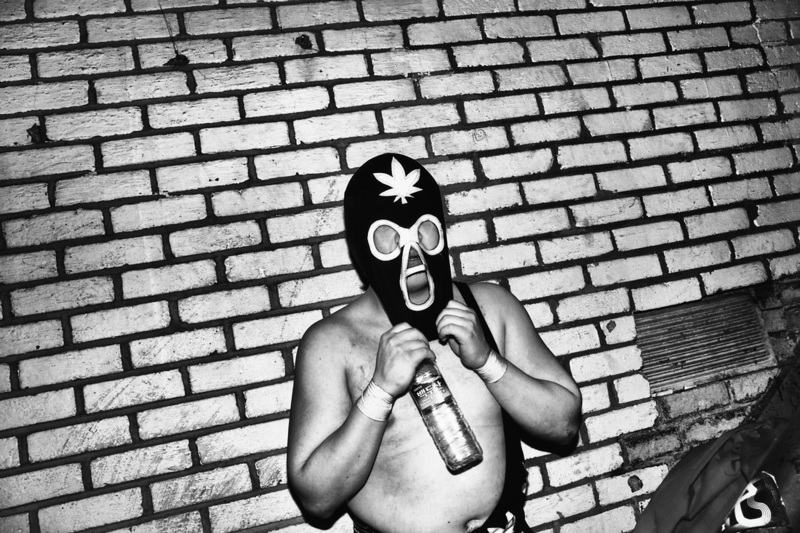 One of South Korea’s only wrestling organizations, they take on stage names to exaggerate their characters’ personas. Some members even don costumes to further play on their theatrical identities. 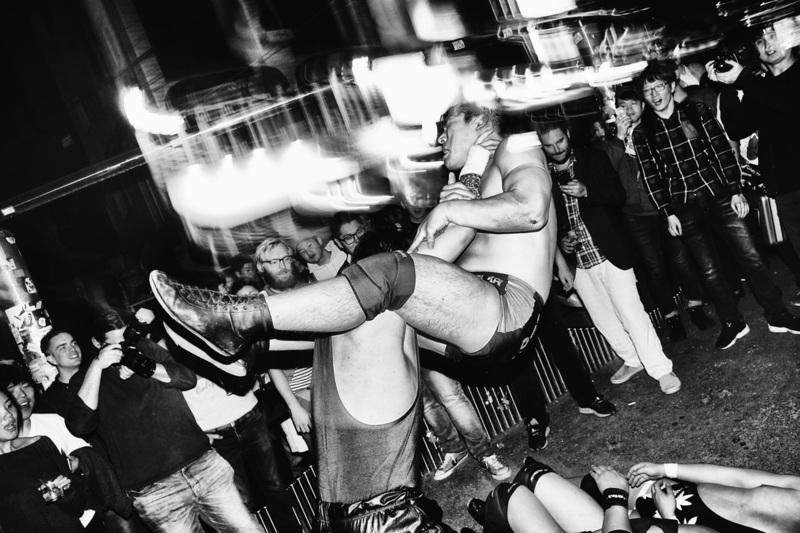 To promote themselves, the troupe showcases their backyard wrestling style at unconventional venues. 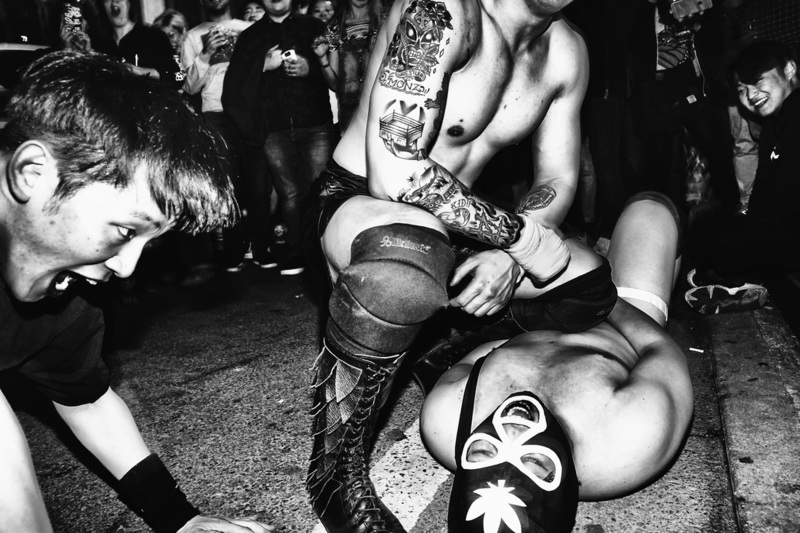 This particular event took place during an underground rock show dubbed, “an unholy unity of music and wrestling.” Between the opening act and the headlining band, the PWF wrestlers were introduced and then immediately started sparring. To the delight of the audience, they quickly took their fight out of the club and into the street. Enticed by its offbeat and overtly masculine nature, the audience couldn’t help but chase after and marvel at this aggressive form of entertainment. During a street fight performance, God Monz pulls and leads Bad Lil Subji by the back of his mask through Hongdae, a region of Seoul in South Korea. Bad Lil Subji lay temporarily knocked out on a city street next to a curb. Looking to land on his opponents below, Bad Lil Subji leaps from the trees growing next to a city parking strip. 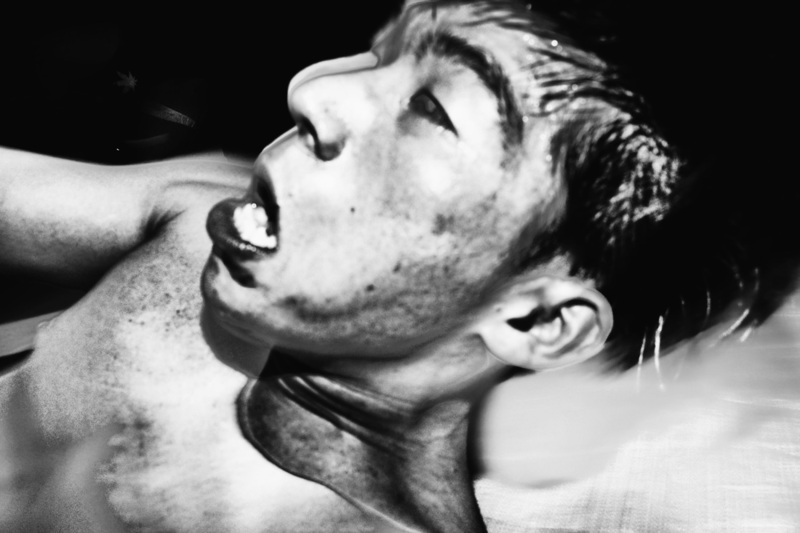 The PWF wrestler known as Mad One gets thrown onto a thin tarp spread across the cement floor of a Club Freebird, a basement level club in Hongdae. With a mid air reversal, God Monz catches Mad One by the throat and slams him down against other PWF wrestlers on the asphalt. Under a tow-away zone sign, God Monz delivers a devastating kick to Bad Lil Subji's head. God Monz keeps a knee on Bad Lil Subji while the PWF referee counts. Mad One and Bad Lil Subji make their way to the back room of Club Freebird after their performances. Pulling his mask down over his face, Bad Lil Subji and the other PWF wrestlers prepare to change out of their outfits. Unmaked after the show, Bad Lil Subji waits outside for the other PWF wrestlers to join him.